One question we hear all the time from customers is how to measure the ROI of social media. While I won’t talk here about the ROI of all social media, I do want to drill into the return on paid social media advertising. This includes traditional display ads on sites like LinkedIn and Facebook, as well as less traditional options such as Facebook Promoted Posts and Twitter Promoted Tweets. For the last year or so, Marketo has been testing all these channels to determine what works and what doesn’t. Here’s what we’ve learned! Here’s a quick run-down of the various types of paid social advertisements that we’ve tested. Promoted Tweets can be targeted to search results (such as specific hashtag) or to specific users (your followers, or users like your followers). These tweets show up in the user’s search results or timeline, are identified as a Promoted Tweet, and typically include a link to a landing page with a registration form. They are priced using a bid/auction system on a cost-per-engagement model, so we pay only when someone clicks, retweets, replies to, or favorites our tweet. We’ve also found it works well to target the hashtag for specific conferences and events (such as #DF12 for Dreamforce 2012). It turns out that when you publish content on your company’s Facebook page, only a small percentage of your fans will see that content in their news feeds. Promoted Posts are a way to increase the “weight” of your posts so more of the people who like your page will see the post; it will also be seen by a larger percentage of the friends of people who interact with your post. 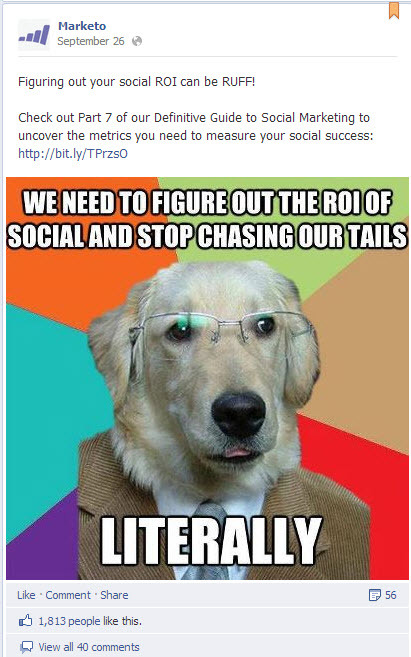 At Marketo, we create fun, visual posts using popular memes that engage our audience AND link to a landing page with a registration form — and then we promote the post to make sure more people see it. This gives us the dual benefit of nurturing the relationship with our fans and generating leads for us. Here’s an example of a recent Promoted Post, and check out more examples in our blog article Don’t Stop A-Meme-In’ — Using Memes for Lead Generation and Buzz Building. Facebook Ads are the ads that show up on the side of a news feed. You can choose from a large list of targeting and interest category options (location, age, interests, friends of connections, etc.). Facebook also recently announced Custom Audiences, which let you target ads to specific users using email address, Facebook UIDs, or phone number. At Marketo, we’ve just begun to test these. They come in two main forms: regular advertisements and Sponsored Stories. With a Sponsored Story, the advertiser highlights the fact that someone’s friend Liked a post or page, which may increase relevance versus a regular ad. You can pay for advertisements on a cost-per-click basis (CPC) or an impressions basis (CPM). Here’s an example of a Sponsored Story versus a regular Facebook Ad, promoting the same content as the above Promoted Post. We also ran a campaign called “Facebook Decals”, which promoted a custom Facebook application that we created to give away cool Revenue Rockstar decals in exchange for a Like. (This was before Timeline, when Like-gates made sense.) Check out the Marketo Revenue Rockstar decal campaign. Using a SlideShare PRO account, Marketo can create a custom-branded look for our pages and can capture leads whenever someone views one of our presentations or wants to download the slides. While this is not a paid social media ad in the same sense as the above examples, it is an increasingly important way to measure and monetize Marketo’s visual content. Note: For more information on these and other ways to use social for lead generation, download our new eBook How to Optimize Your Social Channels for Lead Generation. Investment per Target. This is a straightforward measure of top-of-the-funnel efficiency. Lower investment per target means we’re building our database with qualified potential future customers. These Targets are not yet Leads or Opportunities, and typically need significant lead nurturing before they are ready. Pipeline to Investment Ratio. As we explained in the blog post My Favourite Marketing Metric, pipeline-to-investment is the “one metric to rule them all” since it shows how well your marketing programs are driving what Sales really needs: pipeline. Note that the calculation of pipeline can be subtle depending on how you allocate pipeline to the various marketing programs that influence an opportunity. At Marketo, we look at two allocation methods. First-Touch Pipeline (FT Pipeline) allocates the entire opportunity to the Program that sourced the primary contact for a deal. While that can be useful, we pay more attention to Multi-Touch Pipeline (MT Pipeline). This approach allocates the pipeline and revenue across all the marketing programs that successfully influenced any person attached to an opportunity. For example, let’s say a deal worth $100,000 recently closed, and there were three contacts involved in the deal. We’ve found that, when used as described here, paid social ads can be an effective channel for building your database with in-profile targets and certain types of tactics can drive pipeline cost effectively. First, here are Marketo’s results from using social for lead generation over the last few months. Note that Marketo’s average investment per target prospect across all paid demand generation channels is around $60. 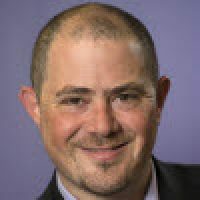 Perhaps more importantly than new lead generation is pipeline generation. Here are our results; as a rule of thumb, we like to see a ratio of multi-touch pipeline to investment greater than 10X. Twitter Promoted Tweets have been a very effective lead gen channel for us, generating almost 3,000 target prospects at a very favorable price ($37). It may be because Twitter Promoted Tweets is relatively new and especially at the beginning there was less competition in the auction, but other factors behind the success include high conversion rates on the landing pages (as high as 14%) and the ability to target specific timelines and keywords. However, when we look at Pipeline the story is less rosy, with a relatively low pipe-to-invest ratio of 3.4. Given the fact that our average prospect needs to be nurtured for four months or more, we will learn over time whether this ratio improves. It may simply be that Twitter biases to particularly early-stage prospects that require longer-than-normal nurturing periods. For more on Marketo’s lead generation success with Twitter Promoted Tweets, check out the Marketo case study on business.twitter.com. Facebook Promoted Posts using Memes delivers our absolute best Investment per Target of only $18, although the overall reach and scale remains much smaller than we’d like. Given the low cost of promoting posts, we are also seeing an attractive ROI in terms of pipeline. We found the magic formula for promoted posts to be this: Clever messaging, with a fun visual, all tied back to a strong offer or piece of content. 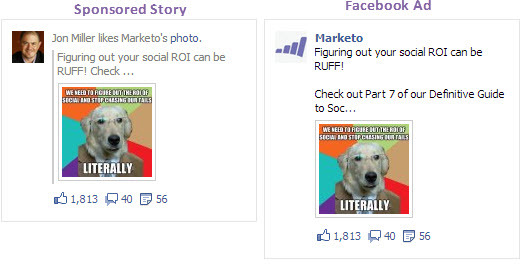 Become a fan of Marketo to be sure you see our new memes as they get published. Facebook Ads and Sponsored Stories are not working well for us, with an Investment per Target of $161 and a ratio of pipeline to investment barely above 2.0. Across all ads, we’re paying $0.28 per click and $0.44 CPM, though the CPC range is as high as $2.00 and as low as $0.03. Given these low costs, this suggests that the poor performance is a combination of low conversion rate on the landing page combined with the fact that many of the clicks are coming from people already in our database. This theory is supported by the fact that the MT pipeline is much higher than the FT pipeline (though it is still low). LinkedIn Advertisements is the poorest performing paid social channel for Marketo, with a poor investment per target and abysmal pipeline ratio. Given the sophistication of their targeting capabilities, this may very well have to do with how we’ve used it, or our creative; further testing and optimization are warranted. SlideShare is the highest ROI paid social channel for Marketo, but only when we look at it from a multi-touch perspective. Since we started using SlideShare PRO, almost 3,000 people have filled out the form on their site. Note, however, that those 3,000 people resulted in a minuscule 57 new targets. That’s why SlideShare has resulted in absolutely zero new first-touch pipeline. It turns out that the people who view and download our content on SlideShare are already in our database, making SlideShare an ineffective channel for new lead generation but an amazing channel for deepening and nurturing existing relationships. With this in mind, we are seeing a stratospheric ratio of MT pipeline-to-investment ratio of 28x with SlideShare. I’m struck by the wide variance of ROI across these tactics. What makes Facebook Memes and SlideShare successful while LinkedIn and Facebook Ads fail? I think the difference is that the former consist of engaging, social content while the latter are traditional display ads — and banner ads are less and less and less effective each day. Moreover, this “interruption-marketing” advertising has even less of a role on social sites than elsewhere. I’ll let others opine on what this means for Facebook’s stock price, but in retrospect, this is not surprising. Social networks are about people talking to people and sharing great content and ideas, not about companies promoting their products to people. Many of the best ways to use social networks don’t involve program budget; they involve brains and sweat and having your fans and friends amplify your message for you. At Marketo, we’ve focused a majority of our social marketing efforts on this concept of “peer to peer amplification”. To learn more about this and other best practices for social media download The Definitive Guide to Social Marketing.